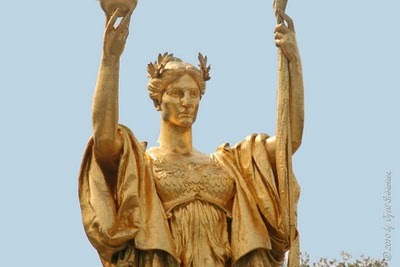 Edith Minturn’s face was immortalized as the “New American Girl” in a portrait by a John Singer Sargent, and she was the model for the famous 65 foot high statue of Daniel Chester French’s Republic displayed at the 1893 Chicago Columbian Exhibition. 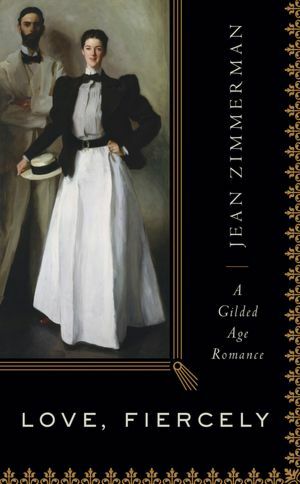 Using the painting as her inspiration, Jean Zimmerman reveals the lives of Edith Minturn, heir to a shipping magnate, (nicknamed Fiercely by her brother) and her husband, Isaac Newton Phelps Stokes, in a story that reads like a fictional romance in Love, Fiercely. At the turn of century that Mark Twain called “The Gilded Age,” fashion and propriety ruled wealthy families. Both Edith and Newton enjoyed the perks of the rich – European travel, posh surroundings, servants, tailor-made clothes. Newton chose architecture over the family banking business, and Edith rebelliously fought for women’s rights – she turned down his first proposal of marriage. The famous portrait came to represent a new freedom for women, with Edith’s pose “with attitude,” the position of the well-placed hat and Newton’s fading into the background. Whenever I can wander the halls of the National Gallery in Washington, D.C. or the Metropolitan Museum in New York City, the portraits always tease me with lingering questions – I wonder who were these patricians and did they do anything besides “sit” for the artist. Jean Zimmerman delivers a well-researched answer on one that reveals the personalities behind the paint. Edith Minturn Stokes and Newton Phelps Stokes are worth knowing. This entry was posted in American history, biography, book review, books, history, nonfiction, reading, travel and tagged American Girl, Chicago Columbian Exposition, Daniel Chester French, Edith Wharton, famous portraits, Fiercely, Gilded Age, Gilded Age Romance, Henry James, Iconography, Iconography of Manhattan Island, Isaac Newton Phelps Stokes, Jean Zimmerman, John Singer Sargent, John Singer Sergant, Love, Metropolitan Museum of Art, New York City, Republic, the Gilded Age, turn of the century. Bookmark the permalink.